NB: The aim of this article is to illustrate WHY one should paradoxically maintain “uncertainty as ones only certainty” as a Scientific Thinker. 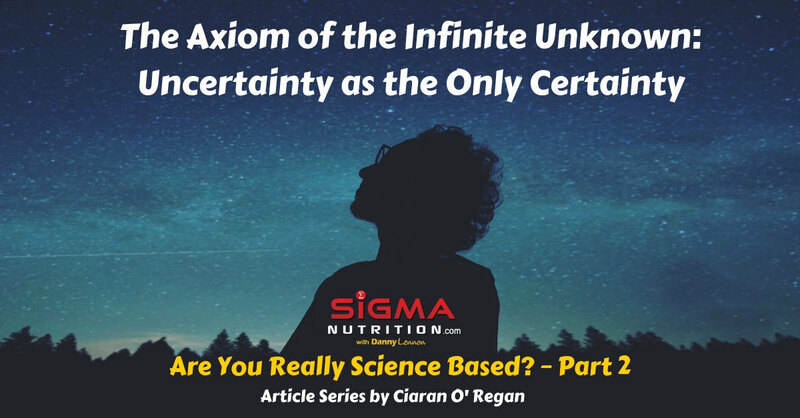 You can read Part 1 of this series: “Uncertainty” in order to acquire the some foundational understanding of the topic that will provide a solid foundation for this article below. The response given by the ST was as follows: “well, if I was presented with sufficient evidence then I would be willing to genuinely entertain the possibility that I am currently incorrect in my views and will consider updating my opinions about how accurately my ideas reflect our known reality”. This response is that of a ST because they maintained enough skepticism and doubt of their own views to be willing to update them in light of evidence; i.e. they remained uncertain. But why one may still find oneself asking is certainty absurd? What makes the Believer Thinker (BT) and the Victim Thinker (VT) so ridiculous? If we imagine that one finds oneself on a very long journey in a car with the three “Thinkers” described previously. Perhaps, after the initial question, one receives a textbook insult from the VT in an attempt to avoid discourse. As a result, a period of some tense silence ensues. Perhaps the BT breaks the silence by angrily asking the ST why they are willing to change their views when they are so obviously correct? To compound the near impossibility of absolute certainty, this thought experiment only references the existing knowledge in a given field. Since you can’t have all the knowledge (known, unknown, or even unknowable) there has ever been in the past, currently exists, or will ever exist in the future, you can’t be certain of anything but the fact that you should remain uncertain. So, what is the major takeaway here? The late futurist and polymath Jacque Fresco once described creativity as the combination of known parts in an unknown way. I wish to extend this viewpoint of creativity to the endeavor of generating an opinion. An individual human can only think from within its individual frame of reference using the known parts (knowledge) it already has in order to interpret the world. Apart from the innate tendencies a human has which are evolutionarily programmed, the knowledge used for the interpretation of the world is gained through experiences. Therefore the more knowledge you have the better you can think and the more accurate your opinions are likely to be as a reflection of reality. To paraphrase Donald Rumsfeld, there are things humans know we know, things we know we don’t know, and things we don’t even know that we don’t even know about. To carry this a step forward, there may also be knowledge that even if we knew we didn’t know, we may not be able to understand even if we had access to it as our ape brains may simply be too limited to sufficiently navigate its complexity. TAIU is based on an individual human representing a limited and finite entity, whilst the Universe represents infinity. Technically, at the very least the Universe represents a metaphorical infinity when we consider it relative to any individual’s ability to know all knowledge there is to know within it. And at best it may even turn out to represent a literal infinity. And, since science is a human endeavor pertaining to the study of the Universe itself, the fundamental axiom for a scientific thinker is therefore one that needs to highlight our perpetual ignorance as the ground floor concept required in order to have the necessary systemized humility to function as a true scientist. If you have made it this far, it may have occurred to you that there is a quite the paradox in accepting TAIU and maintaining “uncertainty as ones only certainty” or in having doubt itself as the only thing one is not to doubt. TAIU sets the table for the concept of maintaining “uncertainty as ones only certainty” because it highlights the inescapably perpetual ignorance of any single human. Maintaining uncertainty as ones only certainty then sets the table for the necessity of identifying one’s sense of self “as the thing that Has views” rather than “As the views themselves” because our acknowledged perpetual ignorance means we need to be willing to change our views in light of evidence. “As” vs “Has” then sets the table for what I call Falsifithinking, which will be discussed in the next article in this series (Part 3). Falsifithinking is the application of Karl Popper’s falsification concept directly to our own opinion formulation in the attempt to combat the innate human tendencies that can negatively impact viewpoint development such as Confirmation Bias, Narrative Fallacy, Negativity Bias, blind tribal conformity, and our poor ability to think in probabilities. Ciaran is a Sport Scientist based in Cork, Ireland. Academically, he received a First Class B.Sc. in Sport and Exercise Sciences from the University of Limerick in 2012. He is also a published researcher who will be embarking upon a Professional Doctorate in 2019 orientated around uncertainty based training planning. Athletically, he was a long-term competitor in combatives with Boxing and K1 Kickboxing being his primary interests. Hobby wise, he claims to enjoy studying psychology and philosophy “way above his intellectual pay grade.” Professionally, he coaches in-person with sports teams and individuals as coaching online here at Sigma Nutrition (apply here for coaching). Sigma Synopsis – The free, weekly email that gives you a run through of recommended content from around the web and takes 20 seconds to skim through. Join here. Sigma Expert Sessions – Access recordings of live discussions with world-class experts in nutrition. Purchase access here. Online Coaching – Apply for coaching from Sigma’s team of coaches using a world-class system to help you to your desired result. Apply here. Recommended Resources – Sigma’s list of recommended resources including books, online courses, research reviews and more. See the list here.